CrimeReports.com, the leader in online crime-mapping, today announced it has raised $7.2 million in a Series B financing led by Austin Ventures, one of the nation’s leading venture and growth equity firms, with participation from existing investor vSpring Capital. This investment will enable CrimeReports to further expand its position as a leader in the rapidly growing public safety software market, introducing innovative web 2.0 tools to increase communication and collaboration between law enforcement agencies and their constituents. CrimeReports.com has defined itself as the leader in adapting emerging web 2.0 technologies to the needs of law enforcement agencies and has experienced significant growth in recent months, expanding its client base by almost 20% over the last two months. This growth is fueled by an unprecedented enthusiasm by law enforcement agencies across the country to adopt these new tools to engage their communities through online crime-mapping, targeted analysis and social media. This rapid adoption also relies on CrimeReports’ innovative SaaS business model and pricing structure, which make it the most affordable suite of crime-mapping, communication and analytics solutions available. The CrimeReports network now publishes crime data for more than 500 law enforcement agencies across North America and, earlier this year, released Command Central, a powerful yet affordable crime analytics and visualization tool for law enforcement agencies. The additional funding will allow CrimeReports to expand the functionality of its current products and expand its offerings to address the growing demand within the law enforcement community to adopt cutting-edge web-based social networking tools. Since we’re already halfway through the summer stimulus spending schedule, it might be a good idea to sit down and look at where our federal funds are going across the country and for what. The White House released these 12 maps that constitute a “Roadmap to Recovery” back in June, so that the President and the rest of us can see where our tax dollars are going to work. 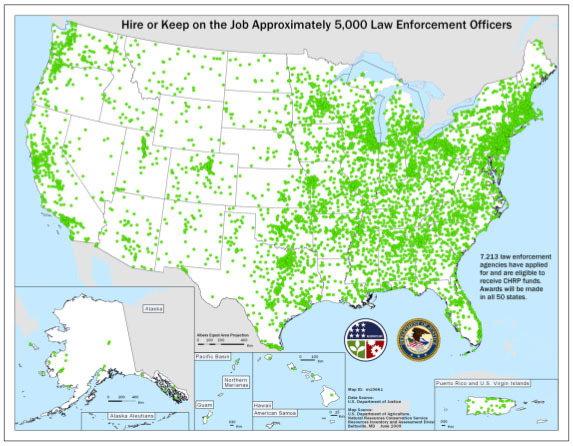 Although all the maps shows potential stimulus spending across the country, of the most importance to us is the map on page 15: “Providing Safe and Secure Neighborhoods for American Families.” This map shows the potential disbursement of federal COPS grants to keep officers on the street or hire new officers. Whether all those departments will actually receive funding remains to be seen. Analysts in Huntington, West Virginia, revealed at a recent city council meeting that they have found a correlation between bars in downtown Huntington and the location of violent crimes. As you can see in the picture at the right, they found that two major bar clusters (in blue) had significant overlap with clusters of recent violent crime (in red). They are quick to point out that this analysis does not show a causal relationship between alcohol consumption and violent crime, but it does show a spatial correlation between bar locations and areas of high violent crime.